It was certainly a beautiful Saturday in Kansas City! 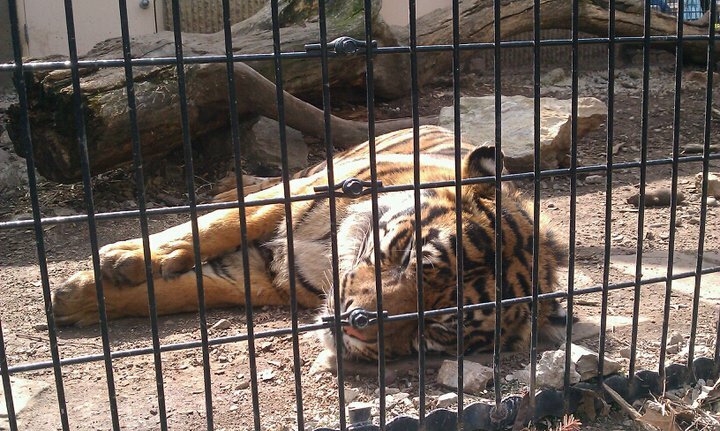 I flanked my trip to the theater with a visit to the KANSAS CITY ZOO and an evening at MACKIN PARK, I swear one of the best parks in this fine country! At least I got some value out of the 75 degree sunny day, and could shed myself of the guilt that comes with hiding indoors for the sake of a movie when clearly, the day is screaming to be enjoyed! I am a bit of a horror buff and I am especially fond of the first entry into the SAW franchise. One could argue that the SAW franchise has been in a downward spiral ever since that first entry, but I did also like what Darren Lynn Bousman did with the series. From my perspective, SAW rocked, II, III, and IV were enjoyable. SAW V was pure GARBAGE and VI only slightly better. SAW VII aka SAW 3-D was a passable entry, being made moderately watchable because it was 3-D. As far as great 3-D films go, it has no place on the list. BUT, it gave us a fresh perspective into the presentation of gore. My Bloody Valentine 3-D had the best ever naked lady running scene, but SAW 3-D brought it with in-your-face flying intestines, etc. Nice. So why have I digressed into this discussion of the SAW series? 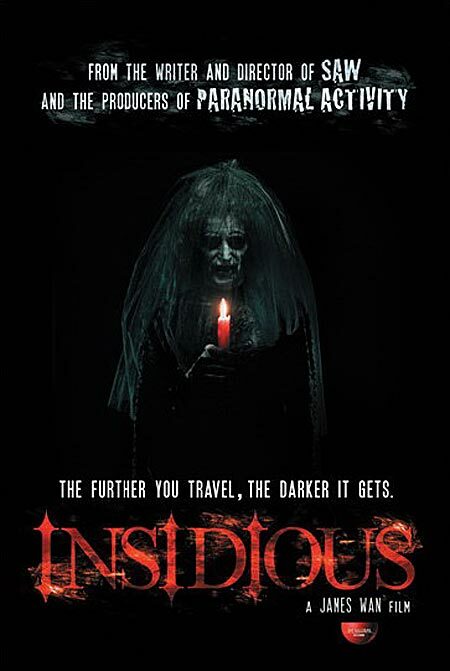 Because the same James Wan who co-wrote and directed that first SAW, directed today's feature: INSIDIOUS. 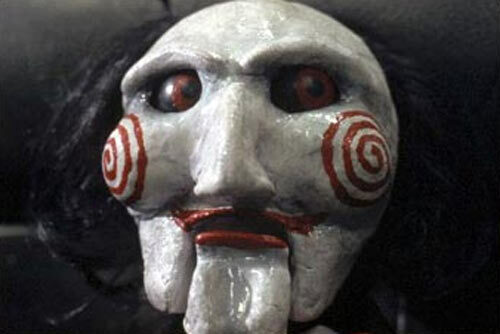 Who was that co-writer for Saw? That would be Leigh Whannell, the sole screenwriter listed for this effort. Whannell is an actor as well, and he portrayed poor, unlucky Adam in the first Saw. He shows up again in this film and his character subtly adds a welcomed bit of humor in an otherwise straight horror film. Saw was a great horror film and WAN returns to those roots here. Wan and Whannell met at film school in Austrailia, with Wan being Malaysian-born and and raised in Australian. Whannell is Austrailian born, and for their abilities to tell modern tales of fright and horror....it makes you wonder what's going on down under! INSIDIOUS is INSIDIOUS. Or so the ads have been telling us! 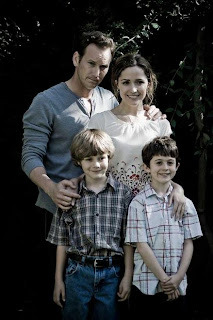 The film follows a family led by actors Patrick Wilson and Rose Byrne, with two sons and an infant daughter living in a beautiful old home. They are moving into the home as we meet them, presumably so that mom, Renai, can pursue her career as a musician, while dad, Josh, works long days as a teacher. Of the their children: Dalton, Foster, and "Baby Girl" Lambert, we become mostly concerned with Dalton, who falls into an unresponsive state after suffering injuries in a fall in the new home. Doctors are stymied and after strange happenings lead Renai to believe something supernatural is afoot, she consults with Josh's mom, Lorraine (Barbara Hershey). Lorraine brings in an old friend to help, Elise, a specialist in supernatural occurrences. Elise is played by Lin Shaye, a veteran character actress with deep roots in the horror genre, having played the role of "teacher" in one of the classic dream sequences from the first A NIGHTMARE ON ELM STREET. She also was the even more infamous, LANDLADY, in the Farrelly Brothers classic, KINGPIN. She is a sweet woman in real life, but she has the ability to convey creepy with the best of them, and not since Zelda Rubenstein's TANGINA in Poltergeist in 1982, has creepy master of the occult been played so well! 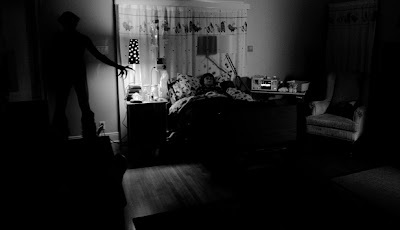 This film in general, channels some of that Poltergeist feel, so it is no surprise to make that leap. Elise brings with her, her two assistants, Specs (Whannell) and Tucker (Angus Sampson). I mentioned Whannell's comic presence here and that is a comment that applies to his partner and foil Tucker. The two are presented as something of a pair of ghost hunters, who are definitely channelling a bit of the original Ghostbusters in their demeanor. Their presence is appreciated, if for no other reason than Ghostbusters still stands as my favorite film of all-time. So there you have it...those are our primaries. The film really takes off after offering the main theory of why Dalton is in this pseudo-coma, defying any medical explanation as he seems perfectly healthy otherwise. Even though the suspected reason is revealed at about the midway point, I don't want to spoil it here. Let me say, though, that this reveal presents a concept of the supernatural that has been featured very little in film. It is very much an original story and I think that as a whole package, this represents an important entry into the horror genre. What a minute Rhino! Horror genre? 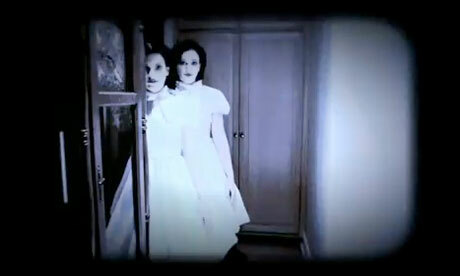 You haven't said anything about horror or anything remotely scary so far! Yes, my astute friends, you are correct. There are plenty of elements of horror and for the first third of this movie, I experienced some of the best jump scares I have endured in many years. Some will argue that jump scares are a lazy cliche in horror films, but I disagree. Scare me however you will, and I will enjoy it! 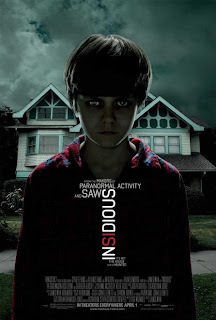 And to make a more complete horror experience, the theme of film is generally creepy and with a child at the center of the story, the creep factor goes even higher! I mean did you see that poster? No, he doesn't look much worse than some of us after a long night on the town, but when its a kid....(shudder)...the creep factor is exponentially increased. 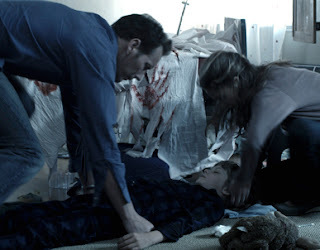 Early in the film, things seems to be occurring as you would expect with a straight haunted house type thriller. The house they use is great and Wan delivers this portion in excellently paced fashion, building tension very slowly. You could argue that things take off too slowly in the beginning, but I disagree. I love the slow build when the jump scares are sufficient to induce bodily functions. And make no mistake, this film with its comedic pair in Specs and Sucker, is nothing like the tongue-in-cheek horror made classic by Sam Raimi. This film is designed as a straight-up scare-fest and the comedic moments given to us by Elise's dynamic duo are more naturalistic as facets of their personality than plainly delivered jokes or actions played solely for laughs. Dammit Rhino, a BUT! Why a BUT? But, the story for all its good, struggles to find a resolution in the final 20 minutes. For our climactic sequence, Wan choose a minimalistic approach, which suits the material. But for a visual medium, I think the overall quality of the film suffered. There is a twist at the end...or maybe not a twist, in so much as a foreseeable turn in the story. I think that once we learn more about our characters and of their plot to revive young Dalton, it becomes very obvious that another of our primaries is going to experience a conflict that only becomes evident as the story unfolds. The problem is that it becomes very obvious. Wan is a very talented visual artist. It was evident in SAW and it is evident here. Pictured below are just some of the imagery he uses to scare up some goose flesh. While I was able to find what I felt was the most startling visual in the film on-line, I am choosing to not show it to keep that a fresh moment. The image is startling, but once you take a moment and realize what you have seen, I think you will draw an unintentional humorous parallel between the character in Insidious and a famous trilogy in sci-fi/fantasy saga. The story struggles at the conclusion, but overall, I was entertained and take from this film the merit that I described earlier. 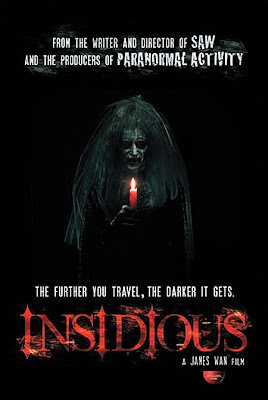 Reel Rhino says it is worth seeing, bring a change of shorts for the jump scares, and relax knowing that INSIDIOUS has received 3.5 of 5 horns. I am extremely excited for next week's HANNA, starring Saorise Ronan as the title lead, and I have included the trailer for it in the trailer section at the bottom of the page. Enjoy! Feel free to write with suggestions, questions, or requests for specific movies to review. Hey, all I can say is no, and if I haven't seen it, I will welcome the chance to see it and review it for your benefit.